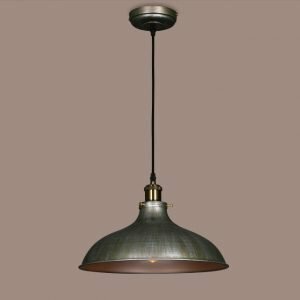 Great for industrial inspired decor settings, this pendant light is made of sturdy hand-worked wrought iron. 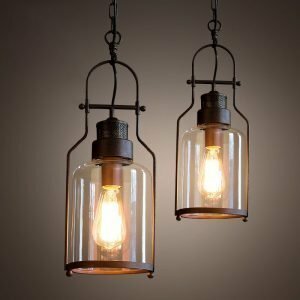 The Avery series features a saucer shape shade covering a cage that houses an Edison bulb, which combines rustic with vintage design. It is finished in black for an understated look and suspended from a round ceiling canopy via an adjustable cable. 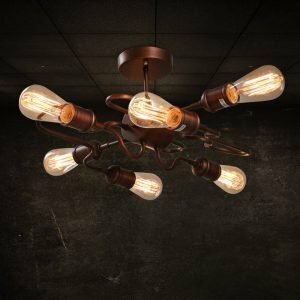 This handsome cage-styled ceiling fixture is perfect for an industrial or rustic style home decor. Make a wonderfully eclectic accent in a modern room, too. 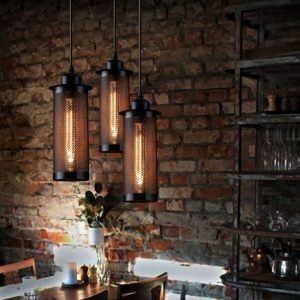 Crafted with black or white finish metal geometric cage surrounding one incandescent bulb, this pendant is sure to become the focal point of your living areas. Simpleness at this design, it features a silver body and gently curved arms with conic shade ends. 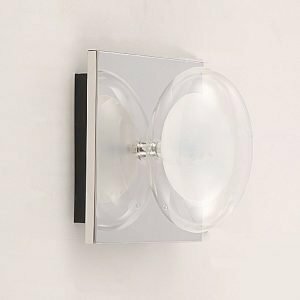 Constructed from high- quality metal and stainless steel, this bath vanity light can be used for a long time and fits many contemporary decoration. Illuminated by three LED lamps, it provides enough lighting for your bathroom. 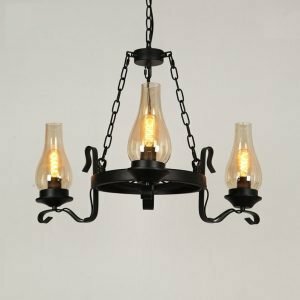 This transitional single pendant light features clear glass in a dome shape with black finish hardware. Its adjustable height ensures perfect placement in your room. 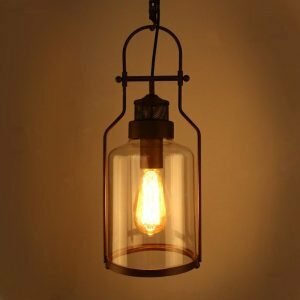 Use an Edison style bulb for a vintage touch. A great way to update your home with stylish sophistication. The Chalk Collection looks graceful and suits any room setting perfectly. It comes in wood shade that adds perfect handcraft. It is suitable for drawing room, bedroom or dining room. It reflects a feeling of warm and sweet which is sure to lend a special atmosphere in every home, brighten your families mood and impress your visitors. 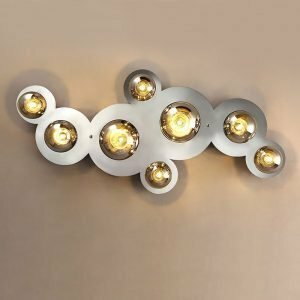 The Coaster wall sconce captures the thrills and chills of a roller coaster ride as its spiraling, offset, three-tiered metal shade stacks up for a stunning, all-white effect. 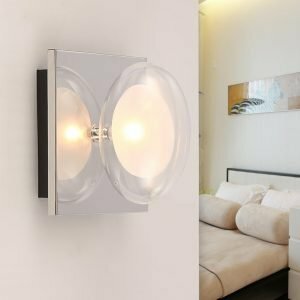 It is an artfully abstract wall sconce that provides up and down light. A fabulous design for bedroom and hallways. 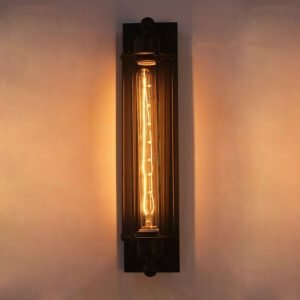 A retro, rustic design to light up your entryway, porch, dining room or kitchen. 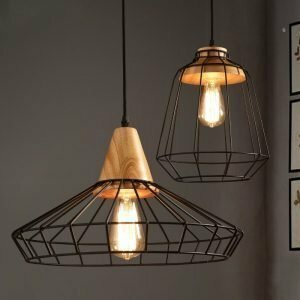 Used singly or in multiple, this beautiful wood and metal pendant light adds an elegant touch to your home decor. Finished in distressed white, this shabby chic style design combines the graceful scrolls with old-fashioned wood for an aged look to fit almost any style decor. 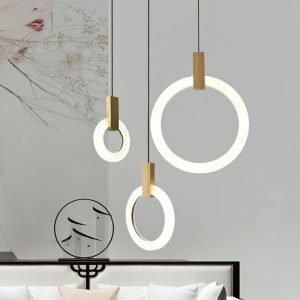 The Draco pendant is made from a series of thin acrylic prismatic fresnel lenses, which creates a refractive effect similar to glass, but without the bulk and weight. 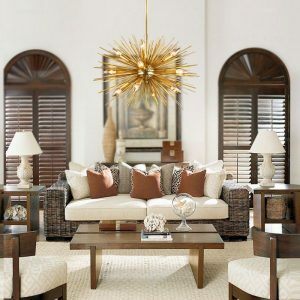 Use this pendant light to upgrade your home decor with a rich brilliance of refracted light. 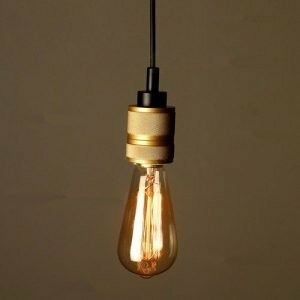 Exposed bulb and cord add a vintage, industrial feel. 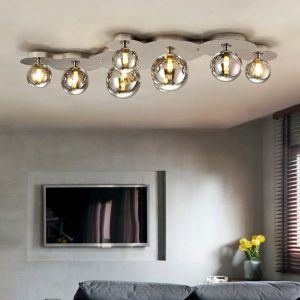 Using various Edison bulbs, you can diy your ideal illumination with this pendant lamp. 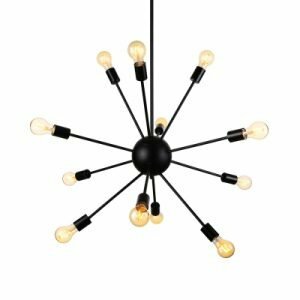 The light is an eye catching addition to retro dining areas, entryways or living rooms. By default, we will send the pendant with black cord, contact us if you need the cord in other color. 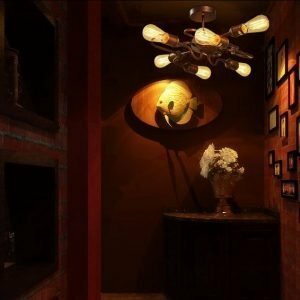 This wall sconce emits a gleaming shimmer when incandescent bulbs are lit. The opal glass flowers which are fixed on the polished chrome frame to showcase a blossoming semi cone. This beautiful and graceful wall fixture is a refreshing addition to a sophisticated room. 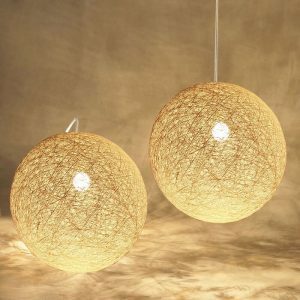 It would be an eye-catching accent for your interior spaces. 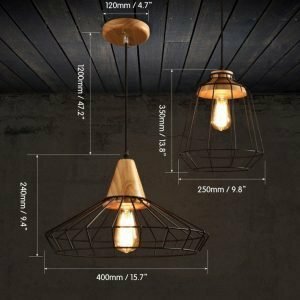 Bold and cheery, this rustic pendant light is inspired by outdoor wire lanterns. Dynamic and intriguing, this design is a fantastic statement piece for cottage and eclectic inspired decor styles. 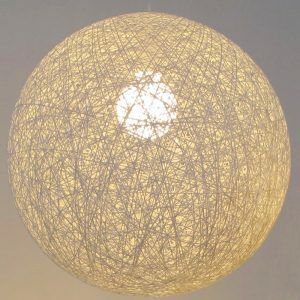 A round cage shade surrounding a globe etched opal glass shade creates warm lighting. It will look great in your hallway or dining room. The creative, sleek form of this colorful glass pendant light is ultimately appealing. The Gem series provides similar shades in enticing colors define the edge, with choices for any decor. The sophisticated shape provides just the right touch of color to any room. 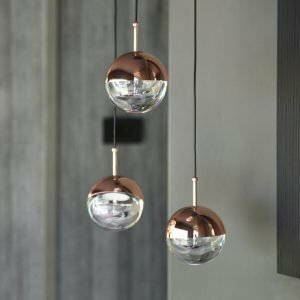 This colored glass pendant light is a perfect choice to hang above a counter or island for a fabulous modern lighting accent. Stone similar shades in enticing colors define the edge, with choices for any decor. The sophisticated shape provides just the right touch of color to any room. Three different shapes of this glass pendant, each is chic for your home decoration. With a bright incandescent bulb shaded in the frosted white glass, it gives off soft warm lighting. Silver finished metal hardwares are connected by a gray cord, which makes the color contrast of this light. It is perfect to install by itself or in multiples. 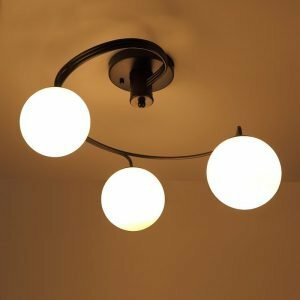 This modern light gets a bright black or white makeover. The shade is constructed from aluminum that is coated with lacquer finish on the outer surface. Add a chic and simple look to make it ideal for a kitchen, dining counter or home lounge. This small fixture can be enhanced by grouping in multiples. 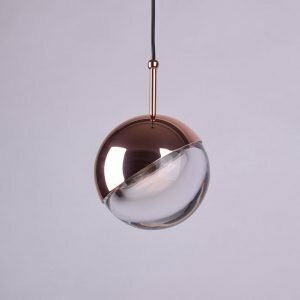 Minimal in design with the ball-typed bulb inspired flair, this mini pendant light features high quality mouth-blown glass with a polished edge envelopes the lamp. 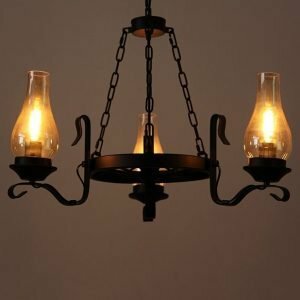 A globe or Edison bulb adds vintage flair for a dramatic look. Perfect in multiples above a bar, kitchen island, or long dining table. 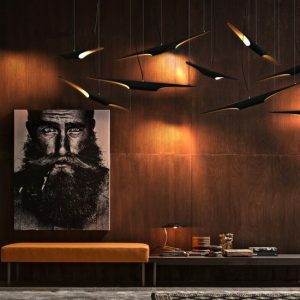 The Planes Pendant Light boldly pairs bright lighting and chaotic form, producing dramatic, delicious results. The apparently casual pattern with which the composition of irregular planes creates a volume around the light source, determines the dynamic character of Plane?s exuberant personality. It provides an intense, vivid and direct light. 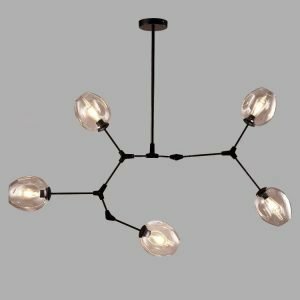 This contemporary ceiling fixture glows with beautiful materials and a spectacular design. It features a chrome finish cylindrical ceiling canopy upon which a cluster ten glass ovals are attached via cables. 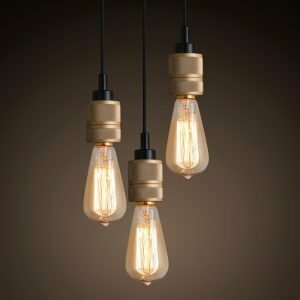 Brilliant halogen bulbs are nestled in pods of opal etched glass within larger pods of clear glass giving a sense of warmth and a welcoming look. The Rullo series design is inspired by a roller for an industrial look. 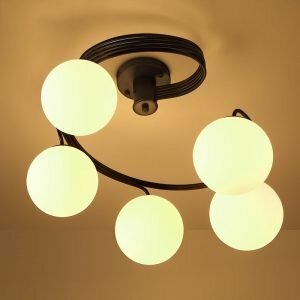 Blending linear symmetry, this single-light pendant is suspended from double adjustable cables, each attaching to a round ceiling canopy. 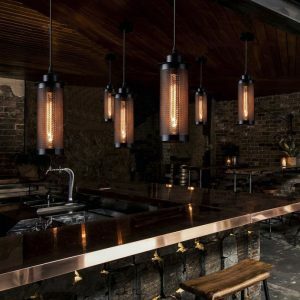 A cylindrical Edison bulb is surrounded by small horizontal poles to create ambient lighting. Black finish for an understated look makes it ideal for many decors. 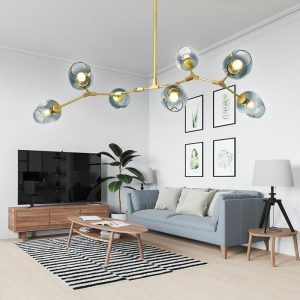 This fabulous Stealth pendant light has a minimalist and modern look. 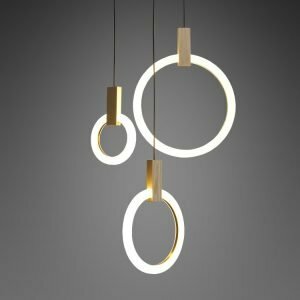 Simple but creative design, with a classic black finish on the outside and a gold finish on the inside, this light is doomed to be eye-catching. 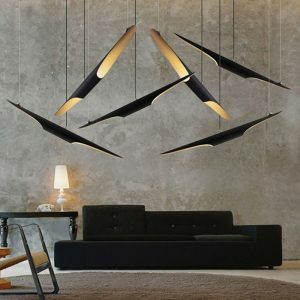 The hanging angle and direction can be varied according to demands, like birds flying in the sky. Perfect either in single or multiple. 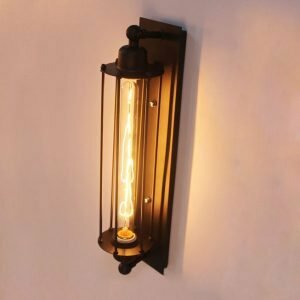 This wall light can be applicable for bedrooms, reading study rooms and more. 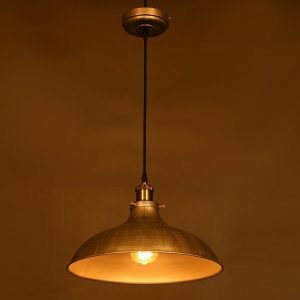 It is a perfect combination of antique design and modern technology thanks to its metal adjustable shade. It will be a focus wherever you put it. With its novelty design, it will give you real enjoyment.